Question 1. River Brahmputra is known by different names in different places.Find the other names of the river. Answer. Tsangpo (in Tibet),Siang,Dihang,Jamuna(in Bangaladesh) are the other names of the river Brahmputra. Q(i). Name the continent in which the Amazon Basin located. Q(ii). What are the crops grown by the people of Amazon Basin? Answer. (i) Toucans, (ii) Humming birds, (iii) Birds of paradise. Q(iv). What are the major cities located on the River Ganga? Answer. (i) Allahabad, (ii) Kanpur, (iii) Varanasi, (iv) Lucknow, (v) Patna and (vi) Kolkata. Q(v). Where in the one-horned rhinoceros found? Answer.One-horned rhinoceros in found in the Brahmputra plain (Assam). (a) Birds. (b) Animals. (c) crops. (a) Ganga Basin. (b) Africa. (c) Amazon. (a) Orange. (b) Hooghly. (c) Bhagirathi. (a) Coniferous trees. (b) Deciduous trees. (c) Shrubs. (a) Mountains. (b) Delta area. (c) Amazon. Question 3. Match the following. Q(i).The rain forests are depleting. Answer.Because of indiscriminate cutting of trees for the sake of development. Q(i). Paddy is grown in the Ganga-Brahmputra plains. Answer.Because paddy requires sufficient water.this region receives amount of rainfall and there is dense network of rivers which help to fulfill the requirement of water for paddy crop. Q(i). On a outline map of Indian sub-continent, Draw the rivers Ganga, Brahmputra from the source to the mouth. Also so the important tributaries of both the rivers. Q(i). 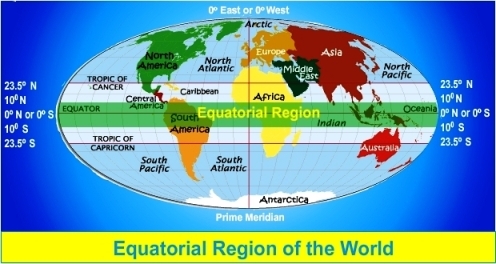 Where does the Equatorial Region lies? Answer. The region which lies between 100N and 10 0S is referred to as the equatorial region. Q(ii). What is river's mouth? Answer. The place where a river flows into another body of water is called the river's mouth..
Q(iii). Which parts are drained by the Amazon river basin? Answer. (i) Portions of Brazil (ii) Parts of Peru, (iii) Bolivia, (iv) Ecuador, (v) Columbia and, (vi) Small part of Venezuela. Q(iv). Which is the largest river basin of the world? Answer. The small river that join the main river are called tributaries. Q(vi). What is catchment area or river basin? Answer. The main river along with all its tributaries that drain an area form a river basin or the catchment area. Q(vii). Which type of vegetation is found in equatorial region? Why? Answer. Thick forests grow in the equatorial region because it rains heavily in this region. Q(viii). Name two plants parasites found in equatorial region? Answer. Bromeliads are special plants that store water in their leaves. Q(x). What work do men and women perform in the rain-forest? Answer. Men hunt and fish along the rivers, while women take care of the crops. Q(xi). Between which latitudes does the Ganga-Brahmputra basin lie? Answer. The Ganga-Brahmputra basin lie in the sub-tropical region that is situated between 100N and 30 0N latitudes. Q(xii). Name the tributaries of the river Ganga? Answer. (i) The Ghaghra. (ii) The son, (iii) The Chambal, (iv) The Gandak and, (v) The Kosi. Q(xiii). Name the food crops which are grown in the Ganga-Brahmputra basin? Answer. (1). Rice. (2).Wheat. (3). Maize. (4).Sorghum. (5).Gram and (6). Millets.